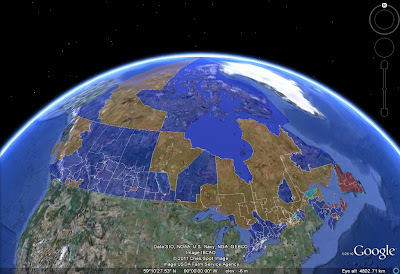 Canadian Election Watch: Innovative: What Movement? A new poll by Innovative Research still shows a three-way race. 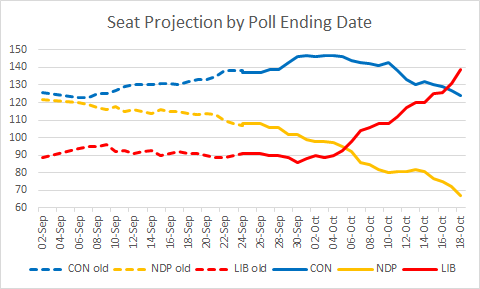 This poll is very much like this morning's Léger poll, except that the NDP held at 34% in Québec (still down 5 from last week's Innovative poll) instead of dropping to 28%. 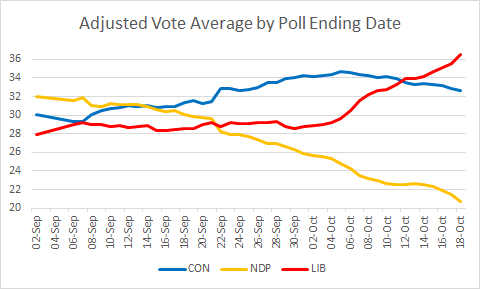 The 9% Liberal lead in ON here (along with the 5% Liberal lead from Léger this morning) essentially neutralizes the Angus Reid poll from yesterday showing the Tories 12% up there. Forum has three riding polls in downtown Toronto. No big surprise there: the NDP is slightly ahead in Spadina--Fort York, the Liberals have a slight lead in Toronto Centre, and it's a tight race in University--Rosedale.